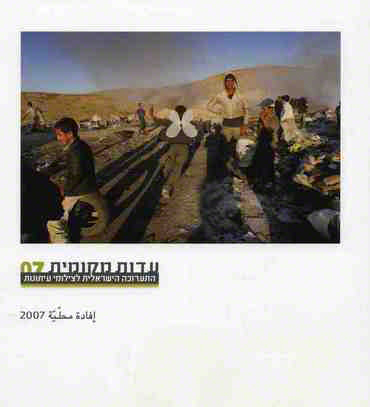 The Meitar Collection took part in producing a catalogue presenting all the pictures of the Exhibition of Local Testimony 2008, in addition to selected pictures from multi-media presentations and articles written by the curator, the co-curator, and Prof. Yossi Yona (who was a member of the jury panel). The catalogue is a direct sequel to the exhibition, and is instrumental in unveiling the Meitar Collection to photographers in Israel. The exhibit of Local Testimony, the result of an exhibition of pictures by professional Israeli photographers, has taken place for several years concurrently with an international competition held by an organization headquartered in Amsterdam, Holland. The international competition was followed by an itinerant exhibit which was shown all over the world throughout the year until the end of the next competition. Local Testimony was created by Dana W, in light of Israel's sizeable exposure in the photographs of the world press, in an attempt to present the Israeli position in the complex reality existing in the country . The Local Testimony 2008 exhibit attracted some 250 professional photographers, who sent in 5500 entries covering various spheres. The curator of the exhibition was Ami Steinitz. The exhibition was held at Dizengoff Center, Tel Aviv between 1 - 31 December 2007 and at the Open Museum of Photography, Tel-Chai between 15 January and 1 March 2008.